2NE1 made an appearance at MBC Music Core on November 13, 2010 performing to their 4th title track, It Hurts. Park Bom (박봄) was seen wearing Christopher Kane Fall 2010 dress in the music video and to the performance at Music Core. 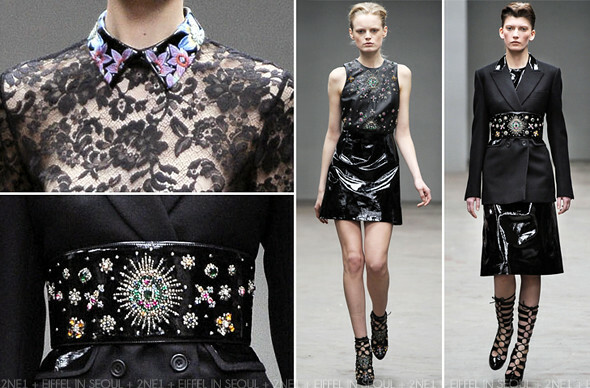 Sandara Park (박산다라) also wore another dress from Christopher Kane Fall 2010 collection to the performance. Her outfit consist of a Embroidered Lace Blouse (USD$1210.00), an Embellished Floral Belt (price unavailable) and a Patent Mini Skirt (USD$986.00). Sheer tights and Giuseppe Zanotti Swarovski-Embellished Sandals to complete the look. Absolutely love her outfit, Sandara Park (박산다라) looks good in almost everything. It's a pity she didn't have many lines to sing in the song. Would love more screen time for her.